The shock wave from the brightest stellar explosion ever seen with the naked eye in recorded history is revealing secrets about the origins of mysterious cosmic rays. That explosion was seen all over Earth in the spring of 1006. 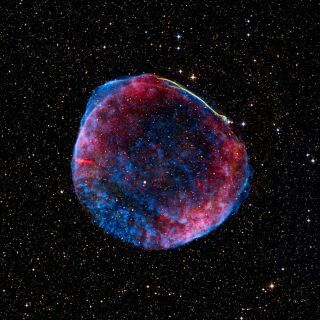 At its peak, supernova SN 1006, which occurred some 7,100 light-years away, was about one-quarter the brightness of the moon, bright enough to cast shadows during the day and for people to read by its light at midnight. Itwas seen above the southern horizon of the night sky, in the constellation Lupus, the Wolf. Two new studies find that the shock waves from such supernovas are responsible for cosmic rays. Sladjana Nikolić, an astrophysicist at the Max Planck Institute for Astronomy in Heidelberg, Germany, and fellow researchers used the European Southern Observatory's Very Large Telescope in Chile to examine the remnant of SN 1006 in detail in 133 locations in the sky. They employed a technique called integral-field unit spectroscopy that allowed them to see both what kind of radiation the shock waves there emitted, as well as where they came from, in high-resolution. Their observations yielded a "data cube." "The idea [of] working on something new and something you never know what to expect from is already exciting and interesting, even without any further results," Nikolic told SPACE.com. "The instrument we used has a high spatial resolution, an order-of-magnitude level higher than the instruments used in all previous studies of optical shock emission. Such a precision gives a more detailed look at the processes happening in the shock." The scientists focused on the northwestern rim of the remnant, which had the brightest visible shock wave radiation. Their data suggest the presence there of protons that may be potential seeds for high-energy cosmic rays. These protons are called "suprathermal," as they are moving much quicker than expected simply from the temperature of the material. The shells of gas from these outbursts, known as supernova remnants, travel at speeds of about 2.2 million mph (3.6 million km/h), producing shock waves that make interstellar gas glow. "Supernova remnants are thought to be laboratories for producing cosmic rays," said Nikolić, lead author of the study unveiled today (Feb. 14). In a separate study also unveiled today, a different team of scientists announced conclusive proof that cosmic ray protons were created in supernova shock waves. The scientists detailed their findings online in the journal Science.